19 Gingerbread Cookies That You SHOULDN’T Leave Out For Santa. #16 Is Deranged. When it comes to Christmas confection, there's probably nothing more impressive than an elaborate gingerbread house. However, the real unsung heroes of the gingerbread world might be the gingerbread men: They can be just as elaborate and cleverly decorated as the houses that they live in. Below are 19 amazing gingerbread cookie decorating ideas that might inspire you to take your icing level to the next level this Christmas. Some of these are so clever, you're not going to want to leave them out for Santa -- in fact, you might want to figure out a way to preserve them forever. #12 will definitely put a huge smile on your face. #1. These gingerbread men have submitted to the dark side. #2. The cookies of anarchy. #3. These guys don't look good, but it's what'son the inside that counts. #4. These cookies are out to save the world. #5. An artful presentation of flexible cookies. #6. These Peanuts gingerbread will really take you back. #7. These reindeer gingerbreads are adorable. #8. These guys feel like they're going to pieces. #9. These cookies celebrate the Day of the Bread. #10. Recognize these guys from outer space? #11. These nutcracker men are pretty impressive. #12. We just feel bad for the one who lost his head. #13. 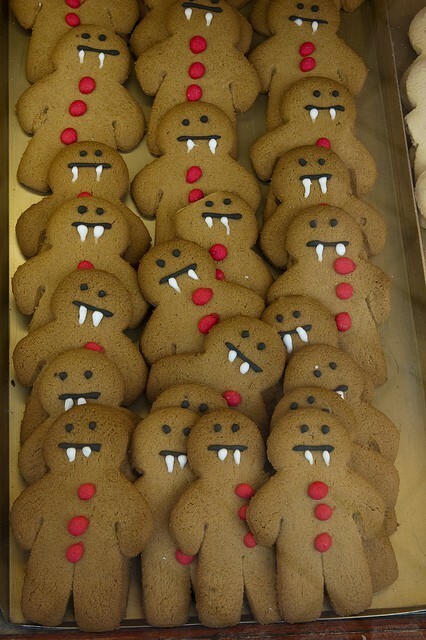 Vampire gingerbread men try to be intimidating, but they're just too cute. #14. Can you name all of these badass dudes? #15. These gingerbread men are perfectly classic. #16. To be honest, Christmas just makes him sick. #17. Yep, this is a wookie cookie. #18. This gingerbread garland would make any living room smell amazing. #19. And finally, your favorite characters from the ultimate winter movie.